What we see on the Moon are rock units, many of which were formed instantaneously. For example, the crater Copernicus disrupted the existing lunar surface and spread deposits as rays and secondary craters - new rock units. Copernicus is one of the largest young craters and its rays define a a chronologic instant in lunar history that we can use to relatively date other rock units. We can safely infer that the surface of Mare Imbrium must be older than Copernicus because the mare is crossed by Copernicus' rays and secondary craters. The formation of large impact basins are much larger, almost Moon wide, events that are used to define time boundaries. Ejecta deposits from the two youngest large basins - Orientale and Imbrium - are nearly instantaneously created rock units. During the 1960s the US Geologic Survey made observations such as these and developed a stratigraphic history of the Moon. That history is summarized in the Survey's Geologic Map of the Moon and in this chart whose colors approximately match those of the Map. The names Copernican, Eratosthenian, Imbrium, Nectarian and pre-Nectarian are commonly used by lunar scientist to describe periods of lunar history. Note how much activity was squeezed into the first 700 million years, and how little has happened during the last three billion! 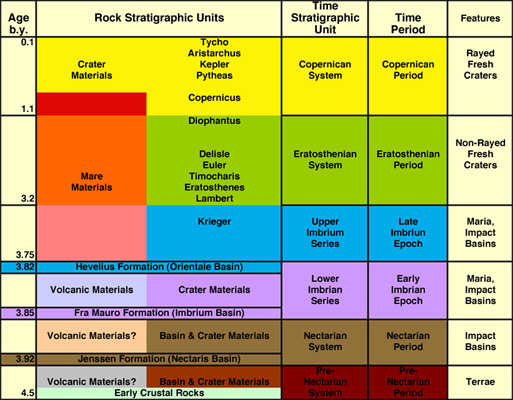 The Geologic History of the Moon by Don E. Wilhelms. US Geol. Surv. PP 1348 (1987). This page was last modified on 7 February 2015, at 19:12.